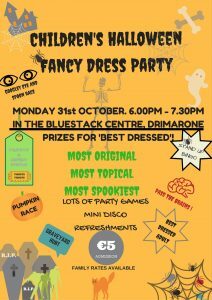 The annual Childrens Halloween Fancy Dress Party will take place on Monday 31st October 6.00pm to 7.30pm in The Bluestack Centre Drimarone. 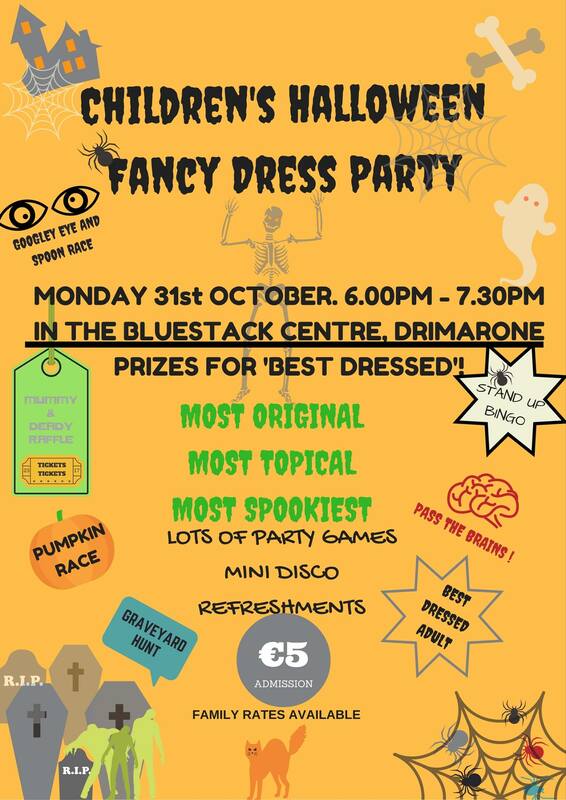 The Halloween party is always a great night for the children and will include new games such as, the googly eye and spoon race, a pumpkin race and the 4 corners game, plus the favourites, Spooky graveyard quiz, Spooky boxes plus many other games…are you brave enough to enter the dark room??? There will be prizes on the night for the best dressed including most original, most topical and the spookiest costumes and for the first time this year there will be a prize for the best dressed adult. There will also be a mini-disco and refreshments will be served. Everyone welcome and don’t forget your torch ! !